UPDATED OCTOBER 2014 – 2015 rates to be announced week of November 10 and published here immediately. A new comprehensive report has been published by the The U.S. Department of Health and Human Services sharing data on actual rates American’s paid for Obamacare health plans under the new law. The report reviewed over 19,000 plans offered by insurers in all 50 states and analyized purchase results on the 34 states using the federally-run health marketplace. 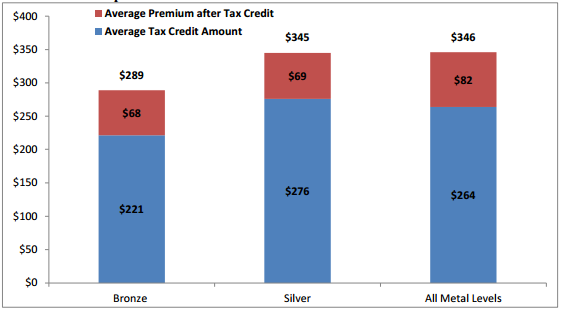 The average monthly insurance cost (“premium”) to consumers was $82 after receiving tax credits from the government. 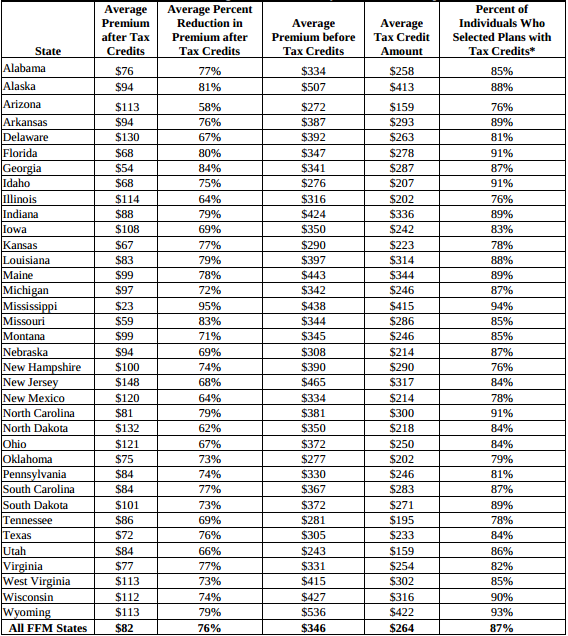 Individuals paid 76 percent less than the full premium amount, on average, as a result of premium tax credits. Overall, the research shows that the majority of people enrolled in Obamacare received a tax credit (87%) and the tax credit enabled them to get a 76% discount on their health insurance. If consumers elect to go with non-Obamacare care coverage instead — one that is not ACA compliant –then they wouldn’t be able to receive the tax credit AND they’d be required to pay a tax penalty at the end of the year. Source: ASPE computations of CMS Federally-facilitated Marketplace data as of 5/12/2014. Full report available here. For more information on your state’s marketplace go here.